Episode 2 of the Emmy Award-winning series premieres this Friday at 9:30 p.m. p.m. ET/PT on SHOWTIME as Broner prepares to challenge the eight-division world champion and future first-ballot Hall of Famer Pacquiao on Saturday, January 19, in the biggest fight of Broner’s career. “When he says, ‘I’m doing it for the hood,’ this is everybody. He’s got us on his back,” says Ross. Broner, an experienced and talented former four-division world champion himself, says he is as focused as he’s ever been. 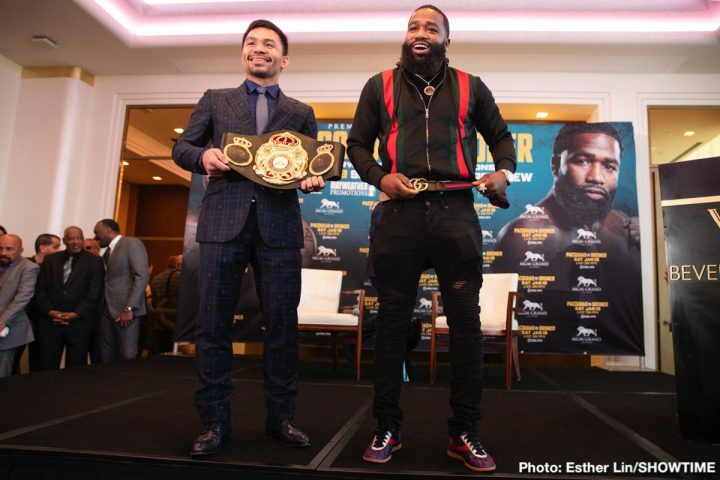 Eight-division world champion and Senator Manny Pacquiao shows his commitment to giving back to the Philippine people in this exclusive clip from Episode 1 of ALL ACCESS: PACQUIAO VS. BRONER. The three-part documentary series premieres this Friday at 10:30 p.m. ET/PT on SHOWTIME and chronicles the buildup to Pacquiao’s first fight in the United States in more than two years. “Giving back is so important because I’ve been there,” Pacquiao explains of his tradition of donating money to his fellow-Filipinos before morning runs through the streets of Manila. “I feel what they feel. Whatever success I accomplish and how much money I earn, I will never forget that feeling. Episode 1 of the Emmy Award-winning series premieres this Friday at 10:30 p.m. p.m. ET/PT on SHOWTIME as Broner prepares to challenge eight-division world champion and future first-ballot Hall of Famer Manny Pacquiao on Saturday, January 19, in the biggest fight of Broner’s career. Episode two of ALL ACCESS: PACQUIAO VS. BRONER will premiere next Friday, January 11 at 9:30 p.m. ET/PT. The acclaimed SHOWTIME Sports original series will be accompanied by ALL ACCESS DAILY, a series of daily digital features released throughout fight week on the networks’ social media channels. New installments of the digital series will be available each day beginning Wednesday, January 16 on the SHOWTIME Sports YouTube channel and SHOWTIME Boxing Facebook page.